Montanita has long been Ecuador's premiere surf destination. In recent years, this quiet beach community has evolved into the country's top party destination. 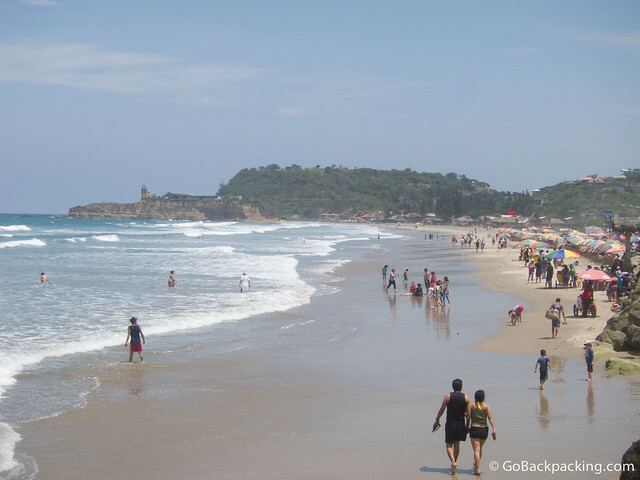 In addition to the influx of foreign travelers, every Wednesday, Ecuadorians of all ages begin arriving from around the country to enjoy the sun, surf, and cocktails. Plus, and this might explain Montanita's popularity with hippies, the area is something of a worry-free zone when it comes to drug enforcement by the police. Marijuana is often smoked openly, and on the weekends, you'll see “happy” (pot) brownies and cakes for sale on the street. Ecstasy and harder drugs are also commonly available. Despite the drug use, compared to the rest of Ecuador, Montanita has a reputation for being safe and relaxed. Within a few hours of arrival, you'll probably start to feel comfortable using your smartphone, camera, or even your laptop in the open, day or night. Most of the restaurants and hostels in the center of town have Wi-Fi. 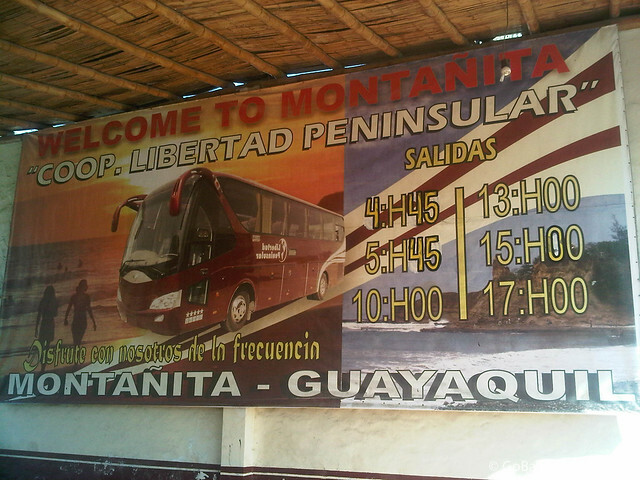 The CLP (Coop Libertad Peninsular) bus company runs direct, daily service between Guayaquil and Montanita for $6. The ride time is about 2 1/2 hours. The drop-off point for Montanita is the main coastal road. Once you get off, collect your bag and cross the street. The center of Montanita is only about 9 square blocks, so you can easily walk around to find a place to stay. Buy your ticket out of Montanita at the CLP office, in a building along the main highway, about 20 meters from where you were dropped off. Walking is the easiest way to get around. The length of the entire town can be walked in 10 minutes, and the duration of the beach can be walked in 10-15 minutes. Bicycles and motorbikes are typically used by travelers and expats staying in the neighboring towns. There's a taxi stand in Montanita near the main coastal highway. However, they're only necessary if you plan to visit neighboring towns. Local buses are useful if you want to visit other towns along the coast, including Puerto Lopez. There are plenty of hostels and budget hotels in Montanita, with ever more under construction, so you should have no trouble finding a place to stay for the night. To ensure a room of your choice on the busier weekends, either book in advance, or arrive before Friday. Due to a combination of construction by day, and music at night, the center of town can be obnoxiously loud. If you want any hope of a good night's sleep, stay a few blocks away from the city center. An oceanside cocktail bar and restaurant on site, a large swimming pool, hammocks and relaxation areas, a games room with billiards and ping pong, are just some of the features at this well like hostel. Away from the craziness along the beach from the town. Very close (but not too close) to the beach and the busy center. A daily breakfast is included, and a shared kitchen available for use. Cocktails and beers available from the bar, communal dinners encourage a interactive social vibe. 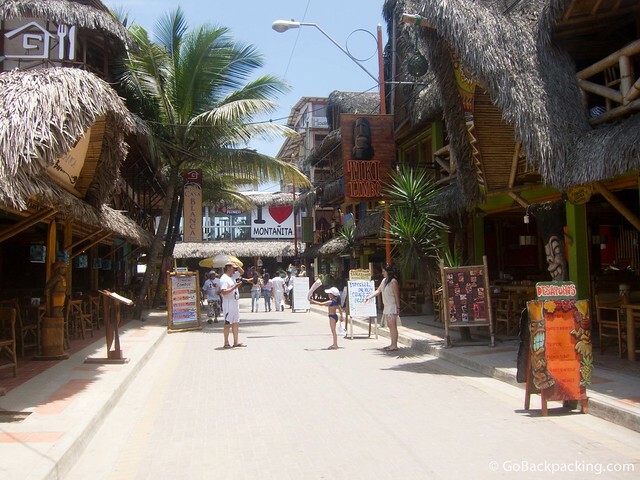 Hostal Mochica Sumpa (Editor's Pick) – Oceanfront hostel on the Malecon (boardwalk), adjacent discoteca Nativa Bambu. The best rooms face the ocean. The waves are just loud enough to soften any loud music from the nearby discoteca. There's a Chilean-owned restaurant below and every Sunday night, they host live bands and a variety of traveling performers. Private rooms with baths are $20/night. However, you can try to negotiate this down. I paid $10/night by agreeing to pay seven nights up front. Tikilimbo – Calle Guido Chiriboga 2 (look for the restaurant by the same name in the center of town). One of the oldest hostels in Montanita also features the most reliable Wi-Fi, both upstairs in the rooms and lounge areas, as well as in the comfortable restaurant at street level. Charo's Hostal – Oceanfront hostel on the Malecon (boardwalk). More hotel than hostal, Charo's features a pool with bar, jacuzzi, and restaurant. The costlier rooms have ocean views. Good Wi-Fi. 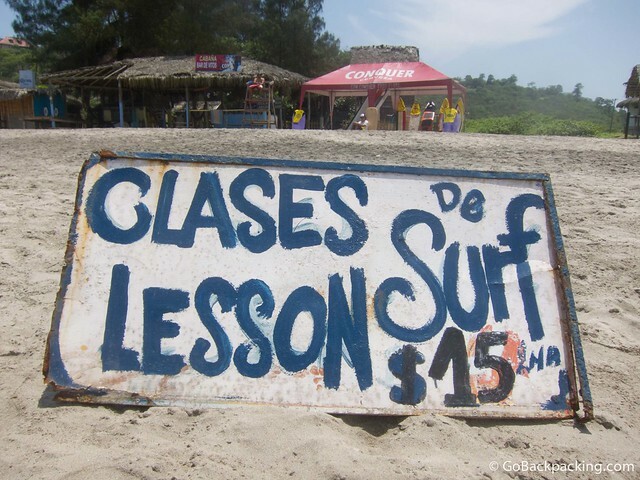 Balsa Surf Camp – A good option if you're serious about learning to surf. 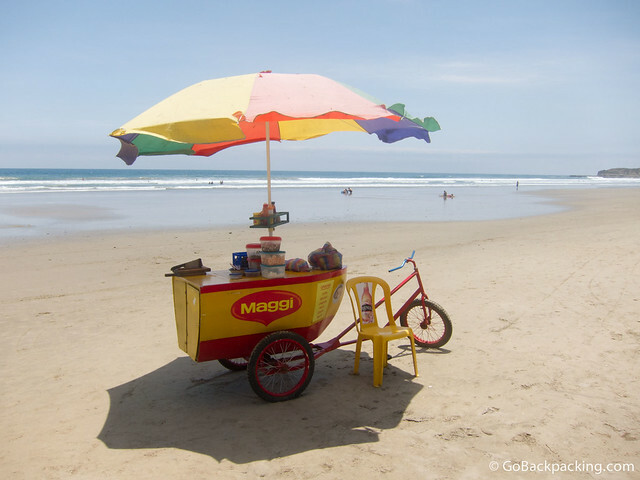 If you decide to spend a few weeks, or months, in Montanita, you can save a lot of money by looking for a room, apartment, or beach hut to rent. Your best bet is to start asking around. The wait staff in any restaurant is a good place to start — most are foreigners. If you're willing to live outside Montanita, the savings can be even greater. I met a Colombian who was paying $30/month for a room in a neighboring village. There are only a few Couchsurfers listed for Montanita. Try it our for free! Montanita is first a surf destination. As the town has developed, so to have the options for other tourism-related activities, such as Spanish classes and whale watching trips. Beach – Montanita is at its best when the sun is shining. Whether you simply go for walks, get in on a pick-up game of soccer, or work on your tan, it's hard to deny life's a beach in Montanita. Surfing – The waves here are suitable for all levels of surfers. If you're a beginner, take a few lessons — they don't get much cheaper. Study Spanish – If you're looking for something productive to do, consider taking group or private Spanish lessons. The Montanita Spanish School sits above the town and features a mix of indoor and outdoor space for classes. The school also offers accommodations, and a variety of activities, from surf lessons, to dance classes on the roof, and even spear fishing. The school offers a fun, community vibe, and many of the students go out partying together. 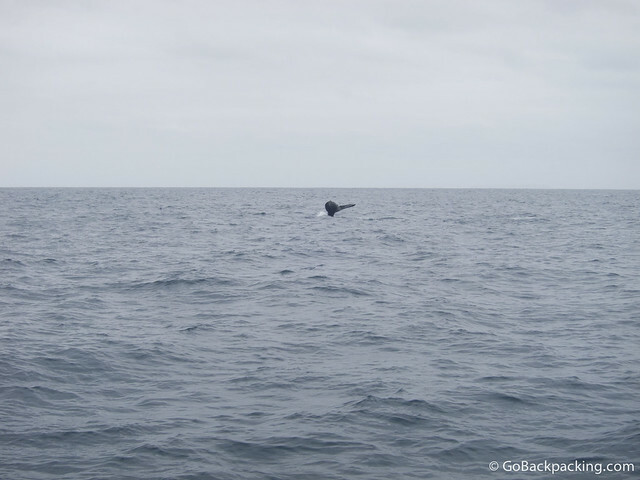 Whale Watching – From June to September, humpback whales visit the coast of Ecuador. The best place to spot these amazing creatures is off the coast of Puerto Lopez, an hour north of Montanita. Organized trips cost $30, including private transportation, a few hours cruising around on a boat, and a mid-day snack. Isla La Plata (Poor Man's Galapagos) – For those travelers who can't make it to the Galapagos Islands, a visit to Isla La Plata offers the chance to view some of the same wildlife, including Blue Footed Boobies, Frigate birds, sea turtles, and sea lions on a budget. Marine Iguanas are not present. The restaurant food in Montanita is average, at best. To save money, and support your fellow travelers, take advantage of the various street foods on offer. 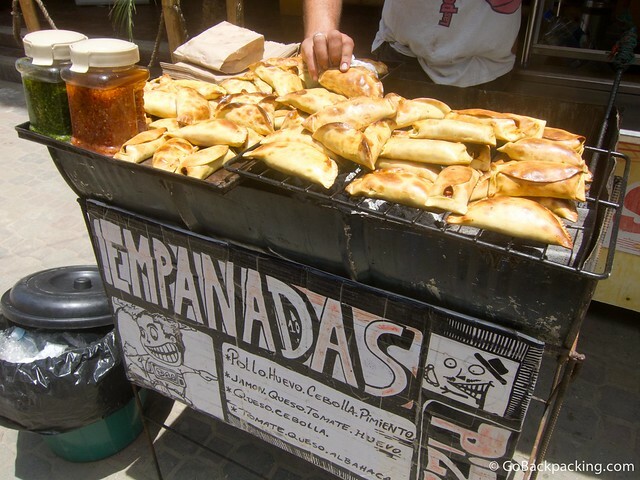 Hippies can be seen walking around town day and night, carrying platters of snack foods, like empanadas, pizza, and chocolate pastries. A serving usually costs $1. Local Ecuadorian street vendors are also a great budget option. You can get a variety of typical foods, from meats on a stick to quesadillas and cheeseburgers for $1.50 – $2. Ceviche – The coast is known for ceviche, and there are lots of vendors happy to mix up a bowl of raw seafood marinated in citric juices for you. The cost is $5, and you can pick which ingredients you want. Fragola Beach Heladeria – Adjacent Mahalo Bar, behind Hola Ola. Go here for artisanal ice creams. Yum. Mont Kaffe – Main street. This small, friendly café serves Colombian coffees, and some of the best sandwiches in town. Sakura – Adjacent Charo's Hostal. This small Asian restaurant was opened by a young Indian woman living in town. Several Indian, Thai, and vegetarian dishes are available. She does an excellent job of creating flavorful dishes given not all the traditional ingredients are available. Tierra Verde – Avenida de las Cocteles, next to Hostal Papaya. I cant' speak for the food, but they offer shisha if you want to smoke. Tikilimbo – Main street. This restaurant offers the most comfortable seating and best Wi-Fi. There's a range of food on offer, from falafel to burritos. The food is hit or miss. Stay away from the tuna — it's frozen and has to be cooked thoroughly as part of the de-thawing process. 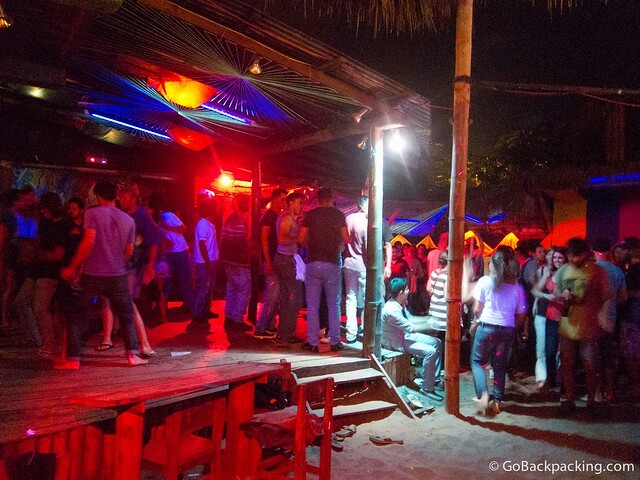 For such a small town, there's no shortage of nightlife options in Montanita. Even on Sundays, the quietest night of the week, you can find some entertainment. Avenida de las Cocteles (Editor's Pick) – A few years ago, cocktail stands began to set up shop on one of the streets running through the center of town to the beach. One thing leads to another, and now both sides of the street are lined with bars offering a full range of cocktails. Careful, the bartenders make sure you get more than your money's worth. One or two cocktails can get you drunk before you even realize it. Most vendors will change the music they play upon request. Recommended: Poeta's bar. Cana Grill – Located along the Ave de Cocteles, this beach bar features a stage for live bands, and dancing, as well as plenty of sand. If you're looking for a party on Wednesday nights, go here. Gato Azul – Late Sunday nights, after the concert outside Mochica Sumpa winds down, people looking to party head for this tiny beach bar for beers and dancing in the sand. Hola Ola Cafe – The weekend kicks off with Ladies Night every Thursday. On Saturday nights, $6 gets you a free vodka-juice concoction from 10 pm – 12 am (cover $6). Safety Tip: Be careful here. I spoke with a foreign girl living in Montanita, and she mentioned the staff at Hola Ola were known to drug people's drinks so they could later be more easily robbed. Mahalo Bar – Located across the street from Hola Ola. Friendly rock bar, complete with stripper pole and pool table. 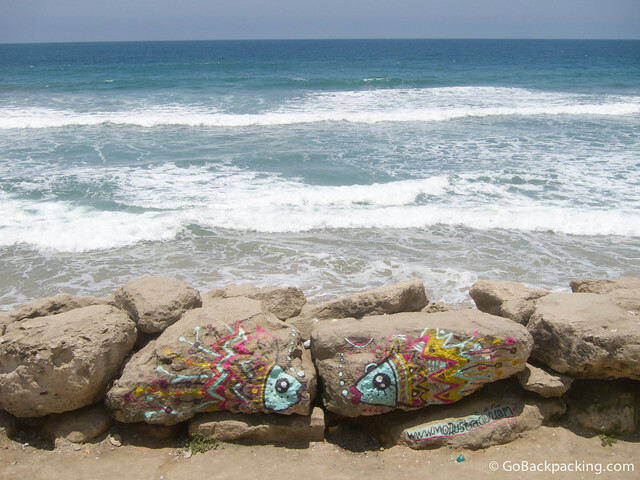 Mochica Sumpa (Editor's Pick) – Malecon (boardwalk). Every Sunday night, live bands perform outside the hostel, with the ocean as a backdrop. Shows start around 10 pm and often run several hours (see video below for a regular singer from Guayaquil). Nativa Bambu (Editor's Pick) – Malecon (boardwalk). The largest club in town features ocean views and an airy atmosphere. Couches add some comfort, and a big dance floor offers partygoers plenty of room.